Access to Zürich Openair on one day of your choice. Access to Zürich Openair on two days of your choice. Access to Zürich Openair on three days of your choice. Access to Zürich Openair on all four days. Access to Zürich Openair on one day, including Camping. Access to Zürich Openair on two days, including Camping. Access to Zürich Openair on three days, including Camping. Access to Zürich Openair on all four days, including Camping. STAY@Zurich Airport is located in Glattbrugg, 0.6 miles from Zurich Airport, and offers a free airport shuttle service, as well as free WiFi access. Public transports can be reached within a 5-minute walk and the centre of Zurich is a 15-minute drive away. Each room at STAY@Zurich Airport is fitted with a flat-screen satellite TV, a refrigerator, a safety deposit box and complimentary tea and coffee making facilities. Featuring a bath, private bathrooms also come with a hairdryer and free toiletries. Some rooms feature a balcony. There are various restaurants, including a Chinese restaurant, in the neighbouring hotel. A fitness centre, which is free for guests, can also be found there. 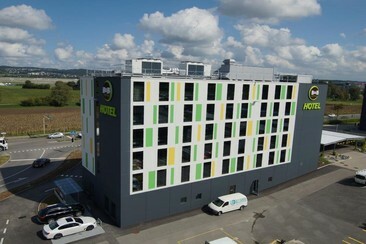 Ibis Budget Zurich Airport is located in Zurich Airport. From here, guests can enjoy easy access to all that the lively city has to offer. With its convenient location, the hotel offers easy access to the city's must-see destinations. 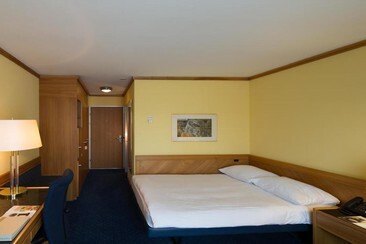 The modern, bright and air-conditioned rooms are equipped with free WIFI, a flat-screen TV. Other amenities include microwave, coin-operated laundry facilities and a terrace. 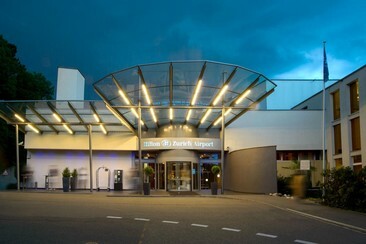 Ideally located close to Zurich’s international airport, train station and city center, B&B Hotel Zürich-Airport Rümlang give you a chance to discover the secrets of the Old City and its major architectural gems such as Fraumünster Church, with its Chagall and Giacometti stained glass windows. For sports enthusiasts, and especially football lovers, visit the FIFA Museum. Characterized by their cozy atmosphere and warm design, all rooms allow you to enjoy a pleasant stay. They feature high-quality mattresses and pillows, iron and ironing boards, desks, LCD TVs with satellite channels, individual heating, air conditioning units, high-speed fibre-optic WiFi and well equipped private bathrooms. What's more, the hotel offers a fresh breakfast buffet consisting of both sweet and savoury options every morning. Bar, car park and shuttle service especially chartered for the hotel are also available. 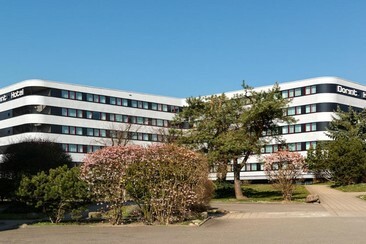 The Dorint Airport-Hotel Zürich was built in the shape of the Swiss Cross and is located in Glattbrugg, 2 km from Zürich Airport; 10 km from the high-end shops on Bahnhofstrasse and 13 km from Zürich Zoologischer Garten. You will discover Theater Rigiblick and Zoo Zurich just 6 km away. Swiss National Museum, or more Zurich Opera House, Lindenhof that make up the richness and diversity of Glattbrugg. The hotel offers 235 stylish rooms with large air-conditioned, the business rooms for events and more. The modern rooms feature free Wi-Fi, flat-screen TVs and minibars, as well as tea and coffeemakers and the private bathroom with shower/ bath, towels, and free toiletries. 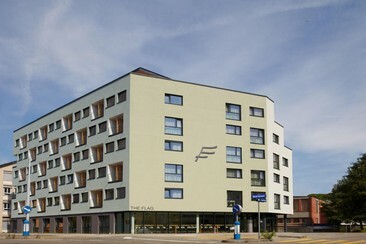 The Flag Zurich is an apartment concept located in Altstetten quarter in Zurich. It offers convenience and amenities such as free WLAN and USB connections, Nespresso Coffee makers and flat-screen TVs. There are 101 rooms in four categories. The 71 Classic rooms have an average size of 18 square metres , the 19 Comfort rooms are on average 22 square metres and the 8 rooms of the Executive category each cover an average area of 26 square metres. The Loft category rooms measure 30 square metres. All rooms offer modern amenities and feature cosy sitting areas, desk, a bathroom, a large fridge and a basic stack of plates and cutlery. The Hilton Zurich Airport hotel is situated only five minutes from Zurich’s international airport and 15 minutes from downtown with its popular lakeside promenade, the old town and many cultural attractions. The bright and spacious rooms are designed with comfort and convenience in mind, boasting contemporary design and thoughtful amenities including large windows, ergonomic chairs, irons and boards, various coffee and tea delights, free WiFi, private bathrooms and more. Some rooms also feature partial garden or city views. Horizon10 Restaurant at the Hilton Zurich Airport hotel offers a selection of International cuisine, Swiss specialties, and delicious buffet options, all freshly prepared in the open kitchen. In addition to it, there is a lobby bar, a 24-hour fitness center, a sauna, a steam bath, and on top of that a jogging track behind the hotel leading through forest and fields with stunning views of the Alps. Zürich Openair is a multi-genre festival in Switzerland's largest city, producing a lineup consisting of rock, indie, hip-hop, electronic, and pop music's most celebrated artists. Year on year, the lineup is as diverse as it is impressive, seeing Kendrick Lamar, Liam Gallagher, Die Antwoord, Imagine Dragons, Adam Beyer, and alt-J headline in 2018's edition. Split between three stages, the timetable is expertly scheduled so no major artists clash, offering the opportunity to consume all facets of the assorted music on display. With circus acts and performances alongside a varied array of international cuisines at your disposal, there's more than simply music to sink your teeth into.